Ever wanted to own a home that came with its own private floodlit football pitch? Well now you can after Clarin House in Clarinbridge, Co Galway was put on the market. The five bedroom house, which has a one bedroom outhouse on its 7.65 acres, is located 16km from Galway city centre. As well as the football pitch, it also has an all-weather tennis court and stables. Built in 2005, the home has 688sqm (7,400 sq ft) of accommodation. The reception hall features an open fireplace and a contemporary staircase leading to the first floor. The reception rooms include a drawing room, music room, dining room and sports room. To the rear, the kitchen is a dual aspect room, fitted with bespoke and custom handmade units. It also features a four-oven Aga cooker giving the room a homely feel and winter warmth. A large utility room is located off the kitchen, while the rest of the ground floor is taken up by a home office, gym and playroom. Moving up a level, the first floor has five generous-sized bedrooms and a large family bathroom. The master bedroom suite has double French doors leading to an outside breakfast terrace. The en suite includes a bath and oversized walk-in shower and the suite also features ‘his and hers’ dressing areas. The remaining three bedrooms are all large and have en suite bath or shower rooms. On the second floor, there is a spacious private office with a balcony and a large games room, which has a fitted audio visual entertainment system and a bar. Outside, the grounds of Clarin House are no less impressive than the interior. From the sports room of the house, guests can divert their attention from the cinema screen and bar to the balcony outside that overlooks a floodlit pitch. There is also a tennis court with night lighting and a block of four stables with a post and railed paddock. There is a sunken outdoor hot tub on the garden terrace and a 72sqm (775sq ft) separate guesthouse.. 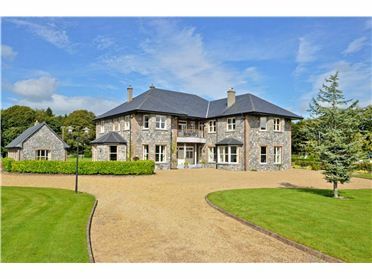 The property is on the market with Sherry FitzGerald Kavanagh and has a price tag of €2.3m. Mortgage Refusal: They just won’t lend me the cash.